An old tradition said: "The devil plowed the river Spree once. He plowed it with two black oxen and loud roar. That was difficult, because the oxen didnt move. The devil took his cap and threw it at the oxen. These jumped around and because of that the Spree is so branched out." It was not so simple surely. If you want to experience the Spreewald in all his sidespages, you are in the right place. 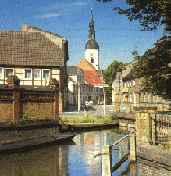 Since 1882, as the teacher Paul Fahlisch of Lübbenau organized the first trips from Berlin to Lübbenau which were called society rides the city has developed to the most popular vacation place of the Spreewald. In the 6.Century the Sorbic tribe of the "Lusizer" came into the Spreewald region. These Slavic tribes were called "Wenden" by the local Germans (Germanen). 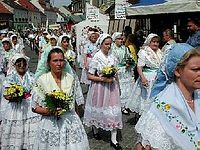 Tradition, customs and language are still maintained and passed on until today by the Sorben. There you can admire the Sorbic / Wendish culture especially in the Spreewald-Museum in Lübbenau and Lehde. 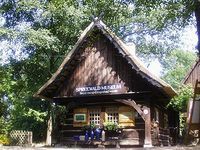 In the Freilandmusem Lehde for example a whole historical Spreewald-village is built up. The Gatehouse Lübbenau contains among other things exhibitions of the history of the tourism in the Spreewald. 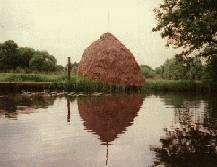 The unique culture landscape of the Spreewald was appointed as a biosphere reservation from the UNESCO in October 1990. 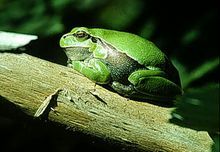 In total about 18.000 plants and animal species are living in the Spreewald and still not all are captured. The people from the Spreewald are very talented in handicraft. Still today some traditional locals are producing their typical Spreewald tools and products in hard work.